For other uses, see Putina (disambiguation). Lyudmila Aleksandrovna Putina (Russian: Людми́ла Алекса́ндровна Пу́тина, pronounced [lʲʊdˈmʲilə ɐlʲɪkˈsandrəvnə pʊˈtʲinə], Lyudmila Aleksandrovna Putina, née Shkrebneva, Шкребнева; born 6 January 1958) is the ex-wife of the Russian President and former Prime Minister Vladimir Putin. On 6 June 2013 it was announced that the couple would divorce by mutual consent. Putina was born in Kaliningrad, Soviet Union, to her parents Alexander Avramovich Shkrebnev and Catherine Tikhonovna Shkrebneva. She was educated as a linguist. In 1986, Putina graduated from the branch of Spanish language and philology of the Department of Philology of Leningrad State University. In her early years she was a flight attendant for the Kaliningrad branch of Aeroflot. From 1990 to 1994 she taught German at the Department of Philology of Leningrad State University. 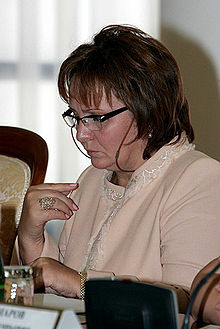 For a few years until 1999 she was a Moscow representative of the JSC Telecominvest. Putina maintained a low profile on the Russian political stage, generally avoiding the limelight except as required by protocol and restricting her public role to supportive statements about her husband. Putina is a curator of a fund aimed to develop the Russian language and sometimes produces statements concerning Russian language and education. Her preference for "maintaining and preserving" the Russian language has led her to make public statements against orthographic reform. The Russian Academy of Science sponsored a commission to study the orthography of the Russian language and propose changes. Their recommendations were made public in 2002 after eight years of work, but were subsequently shot down by Putina, who used Russia's burgeoning economy as one of her reasons why the orthographic reform was not just unnecessary but untimely. However, although one newspaper in Moscow alleged that "Lyudmila Putina de facto cancelled any attempts to reform spelling," the fact remains that public and academic reaction to the reforms were sufficiently negative to have that particular reform attempt abandoned. Lyudmila Putina with Vladimir Putin after his inauguration on 7 May 2000. Putina met Vladimir Putin in Leningrad. 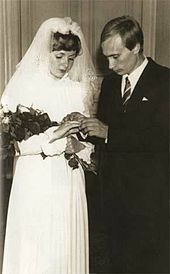 They married on 28 July 1983; they have two daughters, Maria (born 1985) and Yekaterina (Katja) (born 1986 in Dresden, East Germany). They attended the German School in Moscow (Deutsche Schule Moskau) until Putin's appointment as Prime Minister in 1999. Their photographs are not published by the Russian media, and no family portrait has ever been issued. On 6 June 2013, Putina and her husband publicly announced termination of their marriage based on a mutual decision. The divorce announcement was made on camera for Russian news media at the Kremlin Palace, ending years of speculation about their relationship. Presidential spokesman Dmitry Peskov said no official divorce arrangement had been drawn up yet, and he did not know when it would be, but he attached little importance to the formality. ^ a b Baczynska, Gabriela (7 June 2013). "For Lyudmila Putin, solace now that first lady 'shift' is done". Reuters (Moscow). Retrieved 8 June 2013. ^ "GermansSee Shady City Link". The St. Petersburg Times. Retrieved 2014-02-07. ^ "Inopressa: "Телекоминвест" загадывает загадки". Inopressa.ru. Retrieved 2014-02-07. ^ "Moscow". Times Higher Education. 26 April 2002. Retrieved 10 June 2010. ^ "Language debate rages in Russia". BBC News. 18 April 2002. Retrieved 10 June 2010. ^ "Lyudmila Putina Once Called Her Husband a Vampire". The Moscow Times. 7 June 2013. Retrieved 8 June 2013. ^ "Mystery of Russia's missing First Lady: Is Putin's 'affair' with spy Anna Chapman the reason Lyudmila is never seen in public... or is she just locked away in a monastery?". Daily Mail. 23 April 2012. Retrieved 10 May 2012. ^ Hutchinson, Bill (6 June 2013). "Vladimir Putin and wife Lyudmila divorce after 30 years of marriage". Daily News. Retrieved 8 June 2013. ^ "After Night at Ballet, Russia's First Couple Announces Divorce". En.ria.ru. 2002-05-24. Retrieved 2014-02-07. This page was last modified on 7 February 2014 at 19:20.